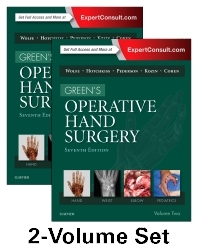 Widely recognized as the gold standard text in hand, wrist, and elbow surgery, Green’s Operative Hand Surgery, 7th Edition, by Drs. Scott Wolfe, William Pederson, Robert Hotchkiss, Scott Kozin, and Mark Cohen, continues the tradition of excellence both in print and online. High-resolution photos, innovative videos, new expert authors, and more ensure that Green’s remains your go-to reference for the most complete, authoritative guidance on the effective surgical and non-surgical management of upper extremity conditions. Well-written and clearly organized, it remains the most trusted reference in hand surgery worldwide.